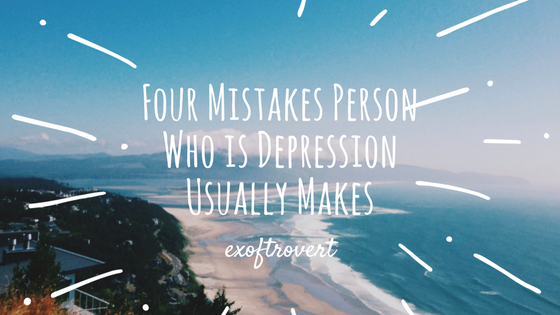 Four Mistakes Person Who is Depression Usually Makes - For those caught in excessive depression and anxiety, many of their natural reactions make the problem worse. Below I will give an example. Previously, if you were included, this article is not intended to judge you, these are just some examples that may occur for those who are depressed or excessive anxiety. The most horrible symptoms of depression are trouble sleeping. Not only makes those who suffer from depression are disturbed but also make the body's stamina decreased. Most of those who have trouble sleeping will just wait until they finally get to sleep. Though they should be able to trouble other things to improve the difficulty of sleep they face. For example by increasing the portion of the exercise. By exercising the body will feel tired and give effect easier to sleep. You who are still undergoing treatment will think if you need a cure for all the problems that befall you, but of course, that's not true. There are pressures that can be overcome with psychological strategies to avoid the tendency of excessive anxiety. The solution you can take is to take time to draw diagrams and write down everything that may be related to you in the diagram, such as relationships with others, eating habits, meditation, change of thinking, problem-solving, etc. The diagram you create will certainly not be the same as another person's diagram because you know best about yourself. There is nothing wrong with asking for help, but if you do it even when you do not need it, you will experience dependence on others. If a depressed person experiences dependency with others, it can lead to anger, resentment, and other problems in social relationships. Usually, this happens if the depressed person asks for help repeatedly with the same person temporarily, that in fact, they can do it on their own. When you are depressed, it does not matter if you behave better to yourself. You can deny whatever you think you do not want to do. Because usually, during a depression, people will be more difficult to concentrate. But, if you keep doing it, you put yourself in a new problem. You will continue to separate from others, isolate yourself, simply because you do not want to do the things you can do but you do not want to do it. For this, you might make a division of time, morning and evening, where you feel you have to do something interesting at one time. So, at least, there are two new things you do in one day. For example, in the morning walk with your pet and on the afternoon you go to shopping groceries at the nearest supermarket. If you can do it, then you will be free from dependence to ask for help from others.